The film tells the story of Salomon “Sally” Perel. Following the “Reichskristallnacht”, the Perels escape to Lódz; but when Hitler overruns Poland, Sally ends up alone in Russia. In an orphanage there, he is reared to be a good communist. During Hitler’s Russia-campaign he is captured by German soldiers. He survives by claiming to be German-born and abducted by the Russians. 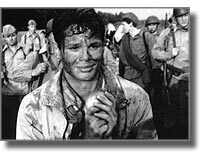 At the age of 16, he joins the army and is educated at an elite Nazi-Academy… The film became a hit in the US and won a Golden Globe Award as Best Foreign Film. Caligari: 11.04. / 10 a.m.